Personalized cabinets are popular for 2016 – and there’s no better way to make cabinets your own than by painting them or selecting a paint-look. It’s also a great way to freshen up the look of your kitchen on a budget. Cabinets don’t have to have a wood-look finish and painting them doesn’t mean you’ll end up with white cabinets. 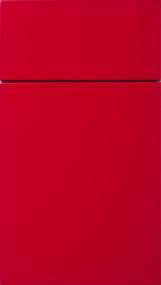 Spice up your cabinets with bold color choices and designer tricks to give your kitchen a quick face-lift. Here’s how. Going with primary colors doesn’t have to look elementary. It’s in the way that you choose them. Blue cabinets can be toned down with neutral countertops and crisp white walls for a modern look. Orange really can be the new black! And used sparingly adds a punch of color that draws your eye and brings a sense of depth and energy to your kitchen. Black cabinets make a dramatic statement, but be careful about going too dark throughout your kitchen. Find ways to bring in the light, such as replacing a few of the cabinet doors with glass, using minimal window treatments to allow for maximum natural light, and going with pale or neutral colors elsewhere in the space. If you’ve chosen a more neutral or light shade for your kitchen, paint the inside of the cabinets a different, unexpected color. Go for a cherry red, lemon yellow or bright orange. If you’re feeling especially bold, match that color to your light fixtures, an accent wall, or backsplash. If you love bright colors, but you’re not sure you want an entirely red kitchen, try adding that painted look to just a portion of your cabinets. Like an accent wall, showcase your color of choice on just the cabinets below the center island, and the pantry door. Then choose a complimentary color such as cream or a paler shade for the remaining cabinets. If you’re having trouble deciding between two colors, go with both. Use the darker of the two colors for the lower cabinets to draw your eye upwards towards the lighter shade. To tie the room together, choose a backsplash that incorporates both colors. You can also choose two shades of the same color. For a different look, use the lighter of the two shades on the recess of the cabinets. 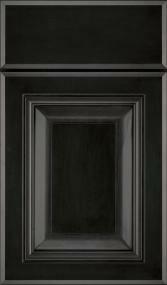 Chalkboard paint on a pantry door can be a smart addition, and a nice way to add a dark accent wall. If you’ve got little ones, use it to paint the base of your center island – it’ll keep them occupied while you’re busy cooking, cleaning or entertaining. Review inspiration images and the numerous options for cabinets. Add what you like to your myProSource Project Center, then discuss it with your ProSource Wholesale trade professional member to move forward on your renovation. Selecting a paint-look cabinet door or using a few cans of paint can do wonders to brighten up the look of your kitchen. Add a tile backsplash and cabinet hardware, and you’ve completely remodeled your kitchen on a modest budget.